Happy Halloween witches and ghouls and ghosties..oh my! I attached the final beads to this last week, and am happy to have it out and done for this Halloween. 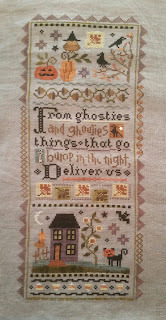 Now just to finish the other 2 Lizzie Kate Halloween pieces I have in my stitching basket. And here is "Daisies" finally framed up and finished. It's hard to see in the the photo but I added gold beads to the center of each little violet in the middle. 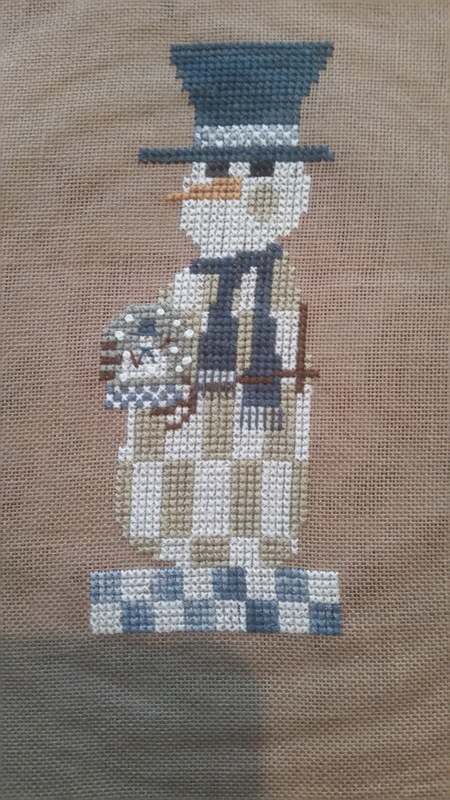 I am also very glad I convinced myself to add the checkerboard edging I was originally going to leave off. It is subtle, but I think it looks very nice against the light gray frame. 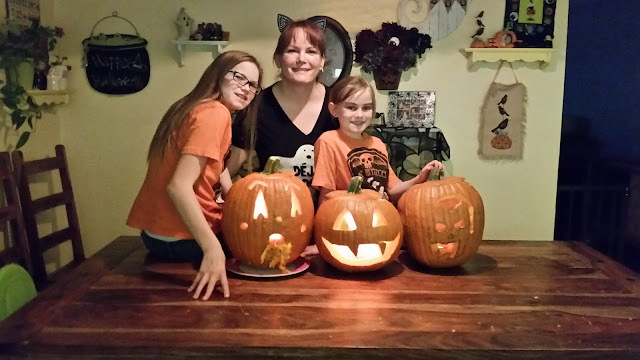 And here is our family pumpkin carving, and yes I am wearing cat ears (why shouldn't a middle aged woman get to dress up a bit!). I love everything about the Halloween season, but can I make a small confession here? I am secretly excited to put it all away tomorrow, and have the house be back to clean and simple for a month before all the Christmas decorations go up. Okay, I hope everyone has seen this one by now. 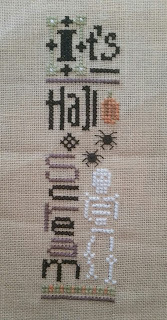 I just finished LK mystery sampler "Spooked " tonight and am excited to have it done just in time for Halloween! Well almost done, I have to add the beads to the circle on the upper left part to make the "31". I have some very pretty purple beads I want to use instead of stitching the numbers. I love how this one turned out, even with a few mistakes along the way (you might notice I had to improvise on the line on the right side of the center panel no idea how I screwed that one up!). 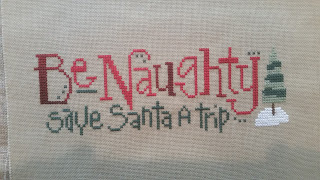 This is my 14th WIP finish for the quarter, though this one has only been in my stitching basket since June of course! And this finally arrived, my Erin Condren planner for 2017! I customized my cover, you might notice there is even a photo of me and my Nora Corbett mermaid in the center! I think the photos turned out well. 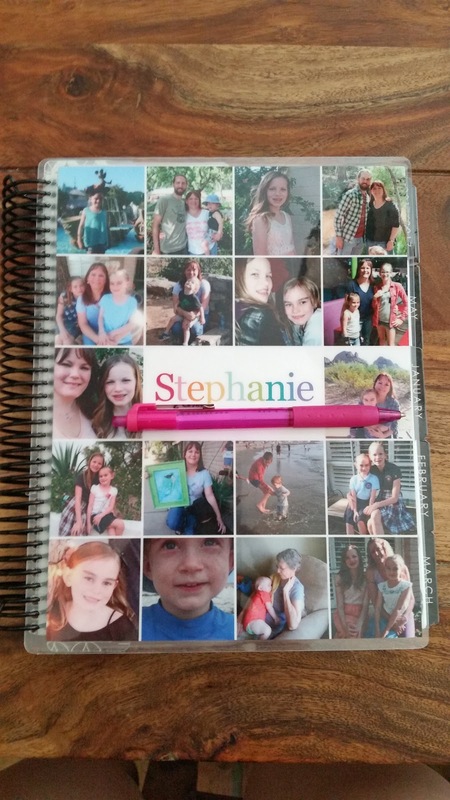 I may order another photo collage cover mid-way through the year since they are pretty cheap ($8) and easy to switch out. I also ordered some custom schedule stickers off of Etsy. I liked the little boxes to write in your work hours. This is one of my first weekly page layouts. I ordered the neutral (black/white) planner instead of the watercolor one so I could decorate it my own way. I'm still not sure if I should have ordered the more colorful version. I love cheerful colors in my planner, but also like a clean-ish page to start with. 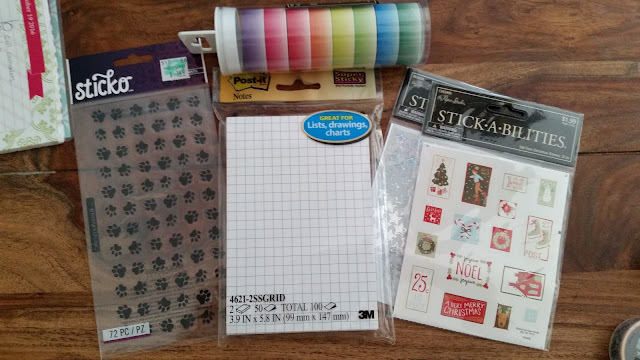 So of course I had to go out and buy a few accessories for it, stickers and pen and washi tape (fun colorful tape to decorate my pages with). I loved the little paw stickers, and plan to use them to help me remember dog baths each month. I also liked the center post-it notes with the grid lines on them. I have seen some amazing bullet journals on Pinterest, and like the idea of using something like this to track things like my running, weight loss, and I even started a little page for # of books read each month. I also found a roll of the washi tape in ombre colors at Hobby Lobby, which makes for a nice "frame" around my pages. So having fun with my new planner. Still on the fence over whether I will love it more than my current one. I think having a weekly view instead of a daily view will help me plan my weeks a little better, but I also liked having more page space each day to write and doodle. 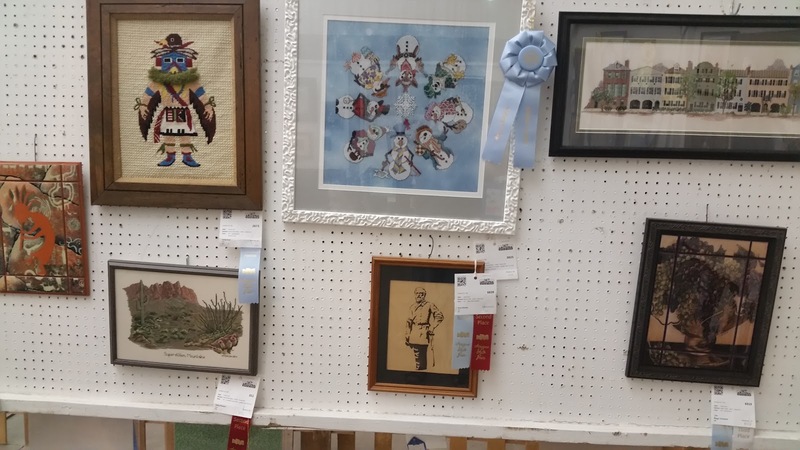 We went to the state fair this week, after me feeling under the weather for most of the week. The fair is only open until Halloween, so I didn't want to risk missing it. 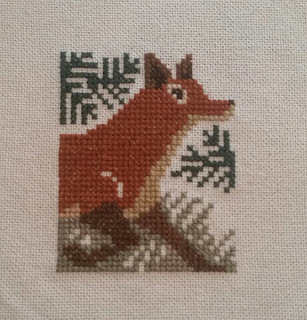 I actually was feeling so sick I didn't accomplish any stitching of my own this week (you know it's bad when I don't even want to lift a needle!) But I have lots of pretty stitching to show you from the fair. 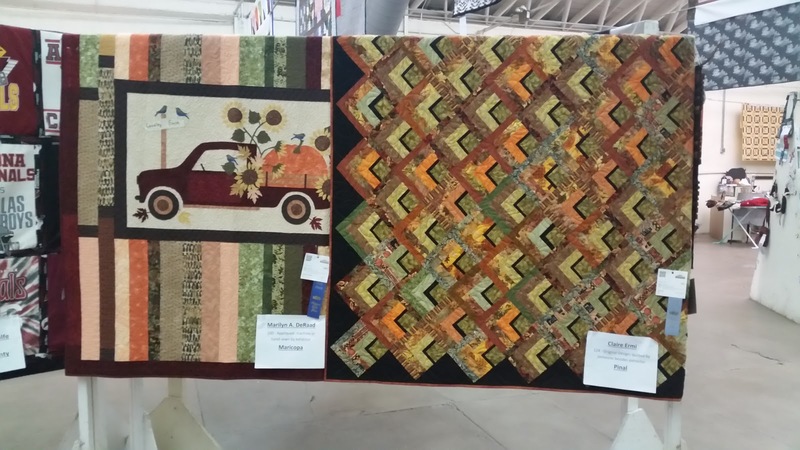 Above is two of the quilts I loved. 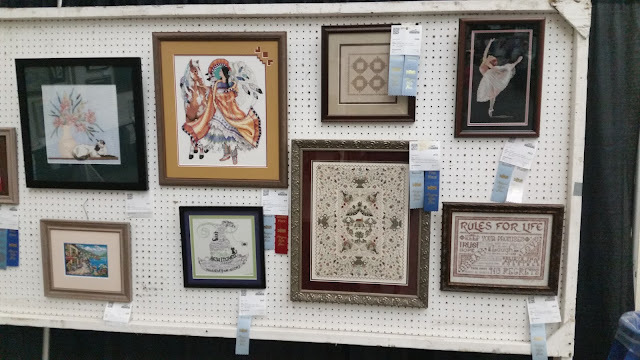 Lots of gorgeous quilting, but they hang the bigger quilts from the rafters so people won't touch them and it makes it hard to get good pictures of them. Aren't the fall colors in these two beautiful? Here is a wall of some of the cross stitching and needlepoint. I loved the fabric used on the snowman circle in the middle. It was hand dyed and had spots of white that looked just like snow against the chilly blue. And isn't that icy white frame perfect for it? Fjord ponies by Ink Circles. I loved seeing the variegated blues on this one, and the stitching was so delicate. Beautiful sampler. 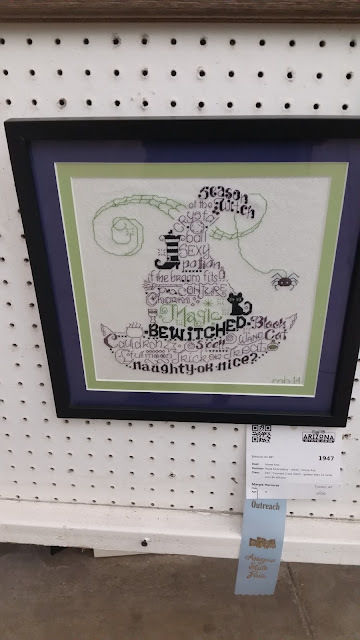 Let's be Wicked-- I think this one is an Ursula Michael's design right? 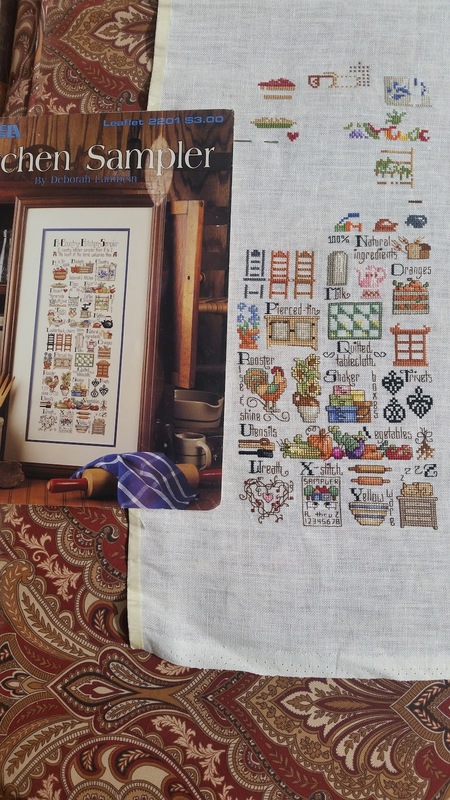 Didn't she do a bunch of word designs for one of the cross stitch magazines? Anyway, I love anything Halloween so this was right up my alley. 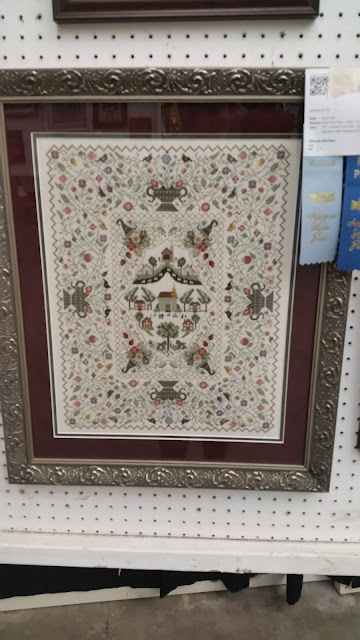 Oh, I forgot the name of this sampler, but it was amazing to see up close! 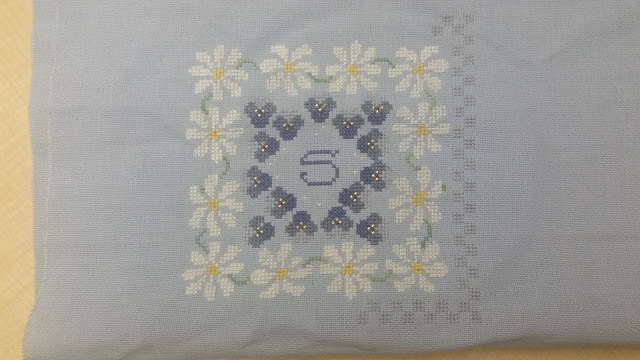 The colors were gorgeous together, and the linen looked so delicate, I couldn't even guess how high a count this was stitched on. 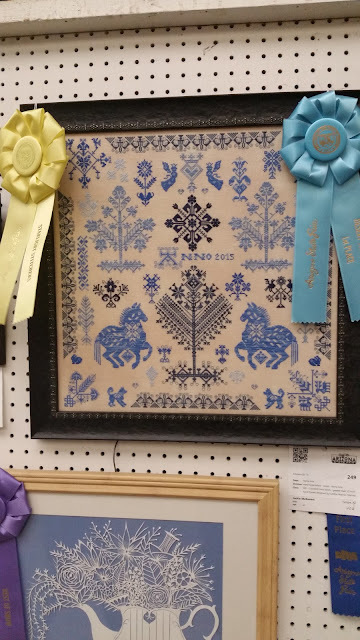 It definitely deserved a blue ribbon. Another blue ribbon piece. They didn't include the name of this design on their entry tag. Maybe a Teresa Wentzler? Solid stitching, and a great design. Lastly I had to share my spooky thrifting haul from today. I love Goodwill and any second hand store, finding unique stuff for cheap is a thrill for me. I found two older Stephen King books, I am working on building a collection of the hard covers of all of his novels. It has been a while since I read these two particular titles. You know what my favorite part of used books is? Finding other people's inscriptions, or notes in the margins, or even just folded over pages that makes me wonder if they ever even finished the book. Also Roald Dahl's Ghost Stories. 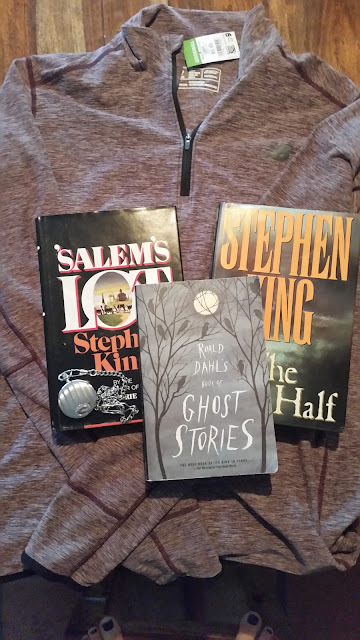 My middle daughter and I have read all of his children's novels, and this is a collection by him of other authors spooky tales. I look forward to sharing it with her. We also found a really nice pocket watch for the same daughter. She is dressing up as Alice in Wonderland this Halloween, and has a little white rabbit to carry with her. So the pocket watch will be attached to the white rabbit's vest as part of his costume. And I found a very nice running jacket for myself. 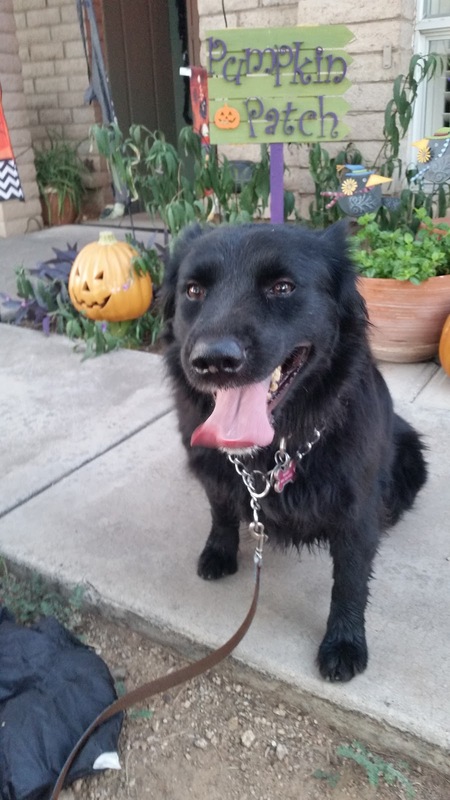 Not that it has been cold enough to need one yet here in Arizona, but I have been running and enjoying the slightly cooler fall temps already. I woke up at two this morning, and tossed and turned for a bit until finally I just gave up and went and put in a movie and stitched for a bit. 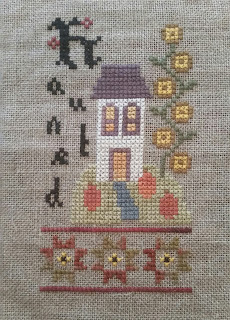 Daisies is done, but I wanted to get it in the frame before showing it off here. 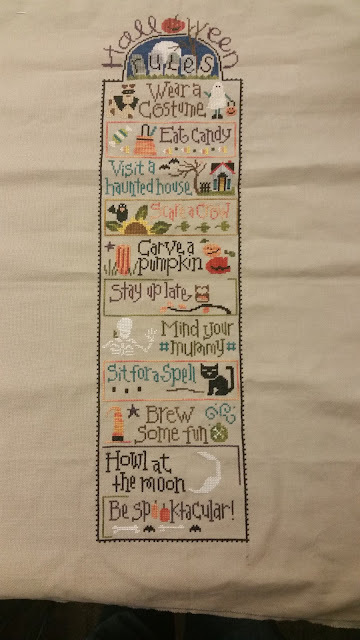 So back to some Halloween stitching (and hopefully finishing!) Above is my Drawn Thread piece, i'd say it's about 50% done. Only four or five colors in this which I like, I am stitching all the ghosts and skeletons in glow in the dark white. Maybe this will be this weeks finish? And here is what I did with the rest of my early morning. 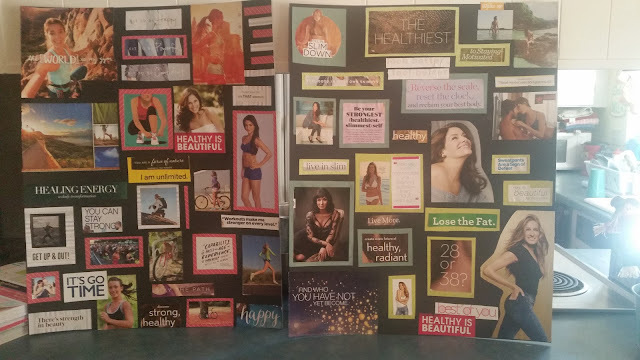 I worked up two new vision boards for myself. One having to do with my goal of running a 10 minute mile by the end of the year (and hopefully a half marathon in January). The other for my goal of losing 35% of my body weight. I tried to pick images that represent healthy instead of just thin. Cause for me, i'll probably never be "skinny" I just want to fit back into size 8 jeans. I will also never again be a 20 year old in a bikini, but I hope to make 40 look good! And here is a project I have been playing around with this weekend. 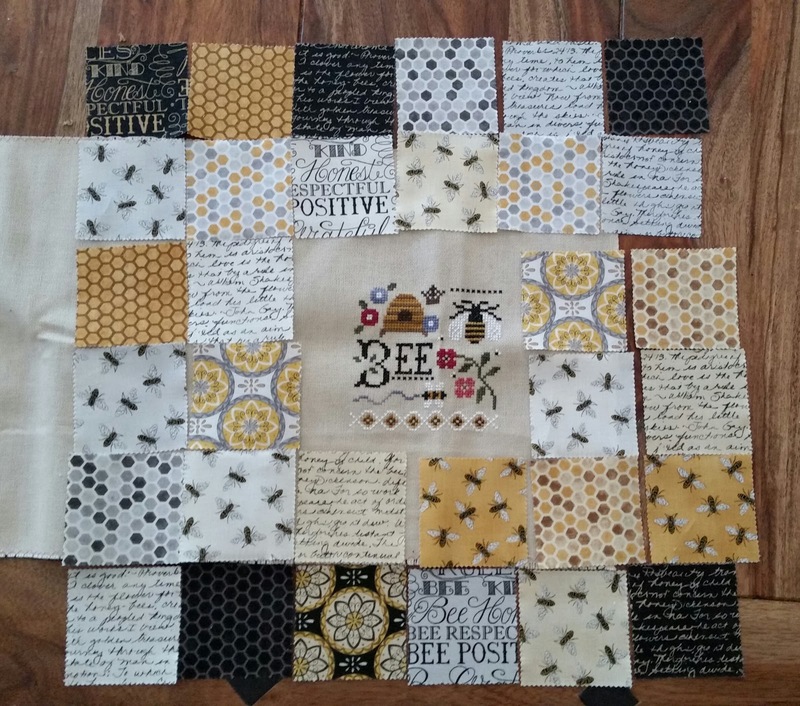 The design is "Little Bee" by Lizzie Kate. I finished stitching it earlier this summer, and now have an idea to turn it into a pillow. I saw the fabric (Moda: Bee Creative) and thought how perfect for my pillow. 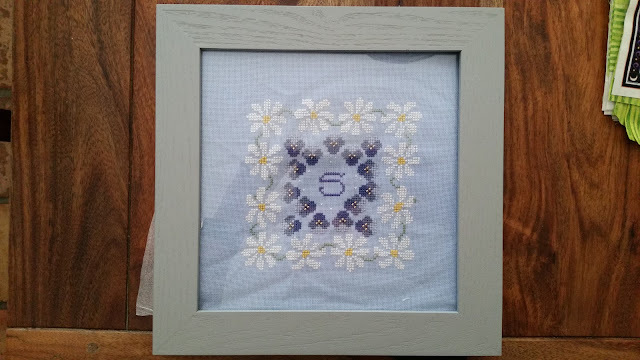 So my idea is to make a hexagon pattern with the fabric to make it look like a honeycomb around my cross stitched piece. In my head it looks fabulous, we will see if my sewing skills are up for the challenge. 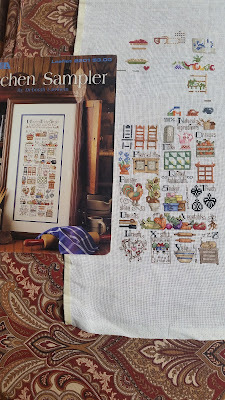 I'll start my post with happy thoughts today, something that never causes me stress and soothes my frayed nerves- cross stitch of course! 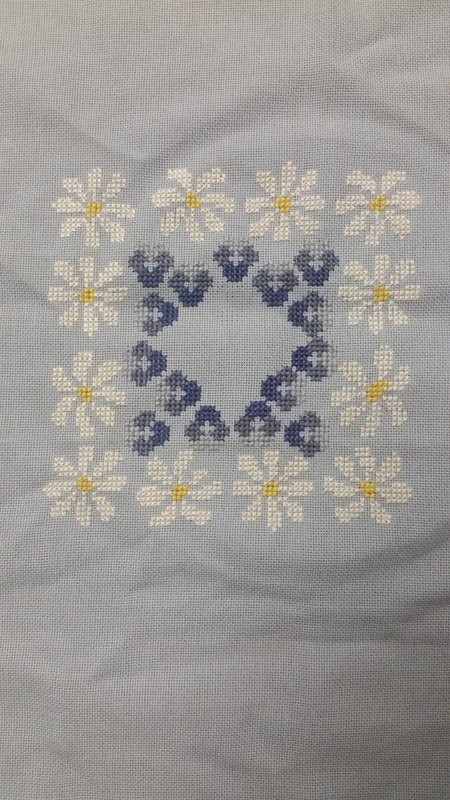 Here is my progress on "Fresh as a Daisy", those squares around the outside are so boring to stitch and hard to even see in this photo, but I think they will really make a difference against the light grey frame I picked for this piece. Eager to get this done! I'm going to blather for a bit now about my first world problem of the week, so if your just here for the stitching maybe skip ahead! It's time to order a new planner for next year. 2017 is coming up quick! 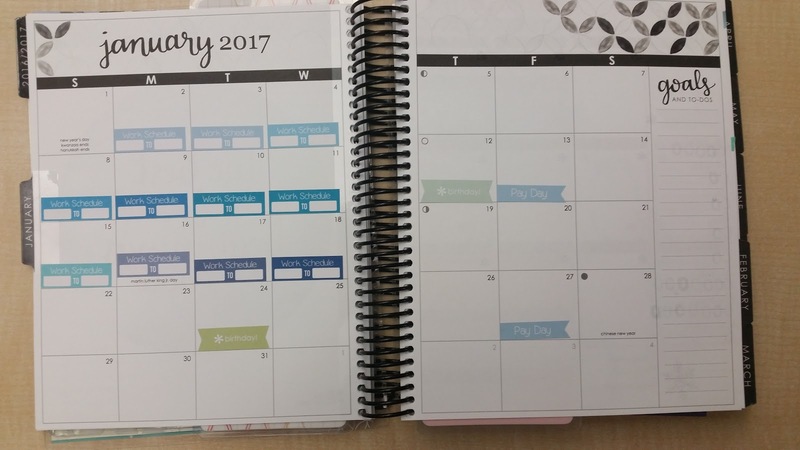 This is the first year I have really committed to using a planner, and I have to say I LOVE IT, it has become such a huge part of my day. And i'm not one of those ladies who decorate their planner, and color code my to do list, and add in a ton of stickers. There are some beautifully decorated planners and journals out there, but mine is strictly business. 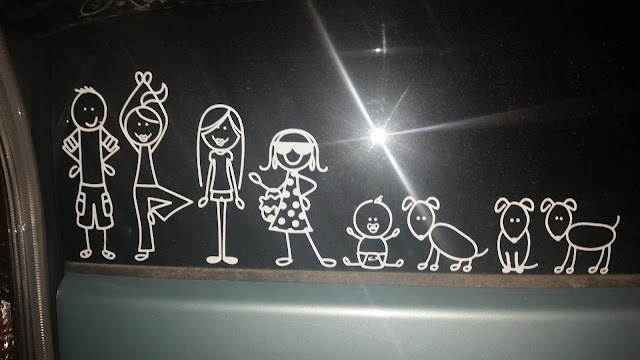 With three kids all in different schools, a husband who works, a full time job of my own, pets who have appointments and schedules of their own, and a house to keep afloat believe me I need some glue to hold it all together. And my planner is the glue to my daily schedule. My husband asked why I don't just use my phone, and occasionally I will save a to do list or shopping list on my phone, but I love having a book I can look back on, and see my weeks/months all in one place. It goes everywhere with me. So my planner this year was a Kitlife planner, It had a page for every day, and goal setting pages, and a nice sturdy laminated cover (that I could tape quotes on to my hearts content). My problem is that I HATE the cover designs for 2017, I just couldn't see carrying it around with me, all three options they offered looked gaudy. Soooo after much stress over it, and watching all the reviews on youtube (there are thousands! ), and comparing planners over and over again, I have made the switch to an Erin Condren planner for next year. They didn't have daily page views, but did have a zillion cover options and options for the colors inside the planner, and a whole cult of planner devotees so I am hoping for the best. I am so nervous though waiting for it to arrive so I can compare it to what I have used and loved this year. For something I will use every day, several times a day for the next 365 days I better love it! 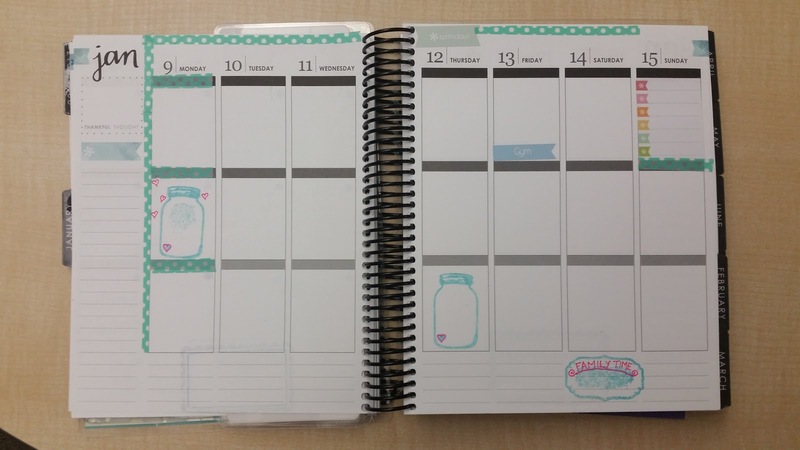 Do you use a planner, or journal, or daily to do list? Any suggestions? 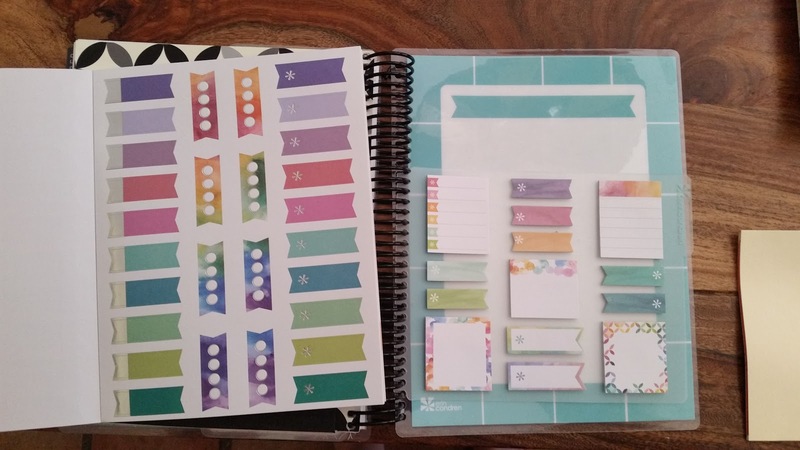 Anyone out there with an Erin Condren that can reassure me they are as awesome as all the reviews say they are? As a disclosure neither company is even aware I exist or paid/gave me anything to write any of the above blather. I'm just a mom who struggles with picking planners. 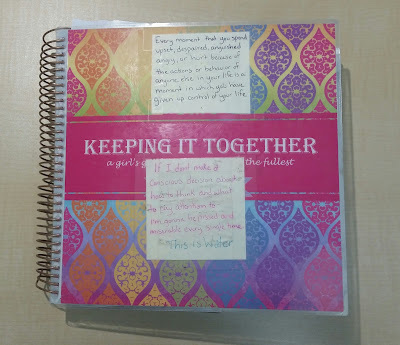 And if you're wondering about the quote I have taped to the front of this years planners, it is from American author David Foster Wallace from a commencement speech "This is Water". It reminds me to stay mindful and grateful in my day to day hamster wheel. There is a wonderful you tube video with his speech here. He talks about going to the grocery store when you are tired and hungry and just sick of being an adult, and remembering to have empathy for others and not get stuck in the mindset that "I am the center of the universe", Something that I think is very important *and sometimes very hard* to remember. 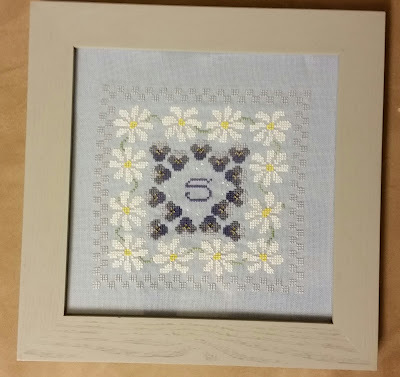 So I thought I had "Fresh as a Daisy" finished this weekend, all the violets in the center are beaded,and initial added. 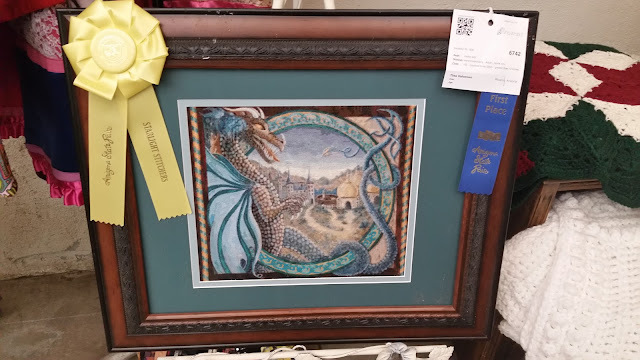 But then I put it in the frame and realized it was not complete. On the chart there is a very subtle checkerboard stitched around the outside of the daisies. Well I left it off thinking it barely showed anyways. Now that I have it in the frame though (excuse the wrinkles it's not ironed yet or laced) I think it needs the little extra to help fill out the frame. So I will be spending tonight stitching endless boring squares around my daisies, but will at least feel better about my finish once they are done. Here is a bit of our Halloween decor this year. 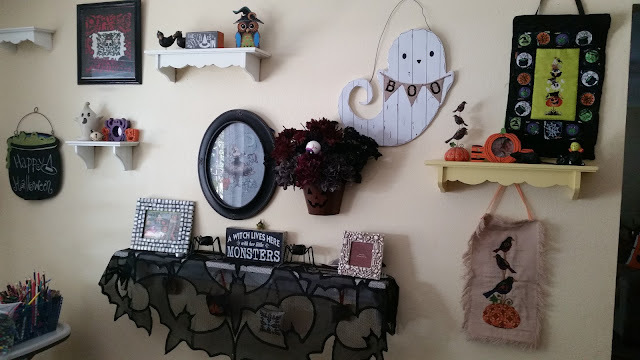 This is the wall of our dining room. On the far left is an skull from a pattern I got off etsy, and then handcut the matting for. 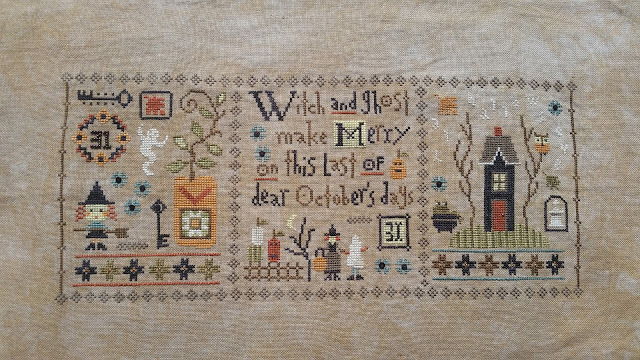 In the oval frame is Trick or Treat fairy by Nora Corbett, on the top right is a Barbara Ana design "Spooky Tree" that I stitched in 2012 and is still one of my favorites (I hand dyed the linen for it also), and on the bottom is one of my oldest Halloween stitches, a Jim Shore design "Halloween Trio". On the shelf above it I have the matching figurine for it. 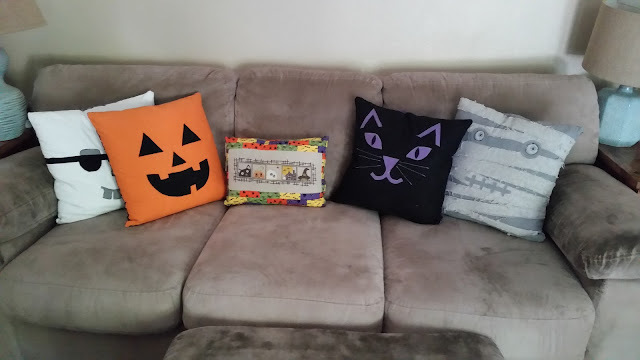 Here is our Halloween couch, I stitched the four pillows last year, from left to right there is a pirate, a pumpkin, a black cat, and a mummy. In the center is a Trilogy Design "Sneak Peak". And last but not least our very spooky powder room, done up in lots of glow in the dark skulls. 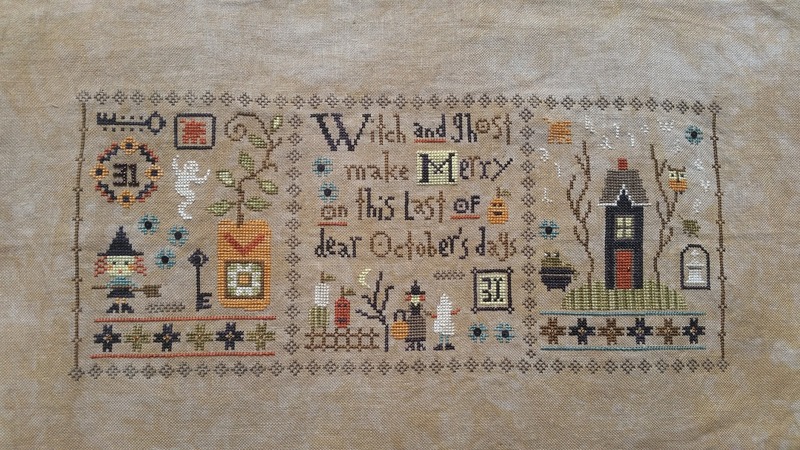 On the shelf is a Lizzie Kate bonus chart from her 2012 Halloween sampler. 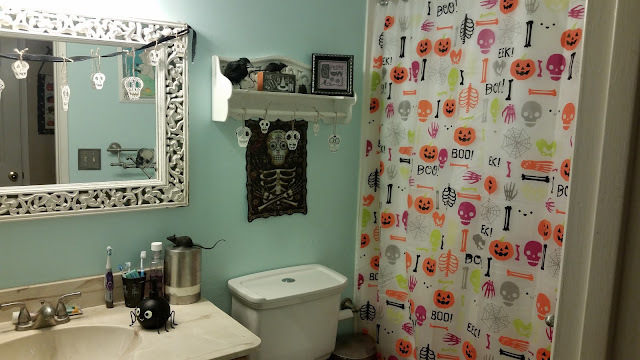 The shower curtain has lots of glow in the dark ghosts on it, plus the spider soap dispenser glows, and the skulls on the mirror I painted with glow in the dark paint. Our toddler keeps trying to take everyone in there and shut the door so he can show off the spookiness. In the midst of all the Halloween decorating I have been getting ready to stitch up some Christmas ornaments. 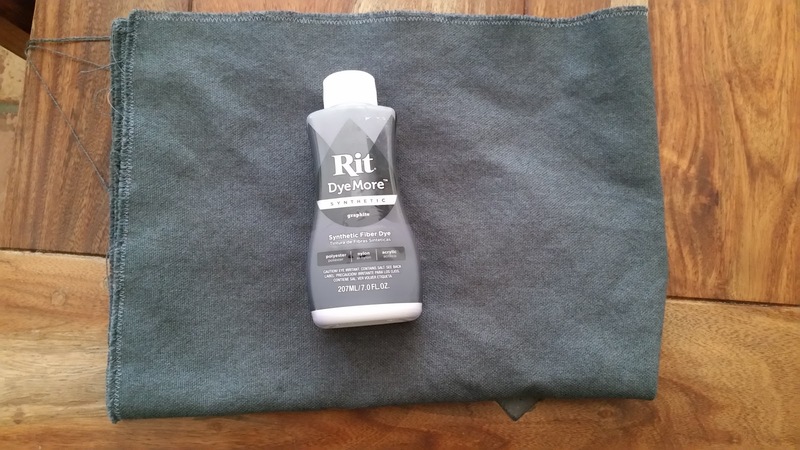 I hand dyed the linen I am using for them, and just have to brag about how great it turned out. 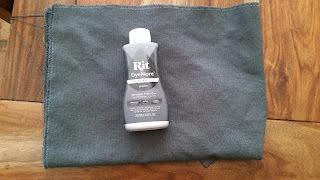 I used RIT liquid dye in "graphite" for a chalkboard effect, and I love the color. It is not quite as variegated as it would have been if I had spent the $$ on over-dyed fabric, but for something small like ornaments it will do just fine! 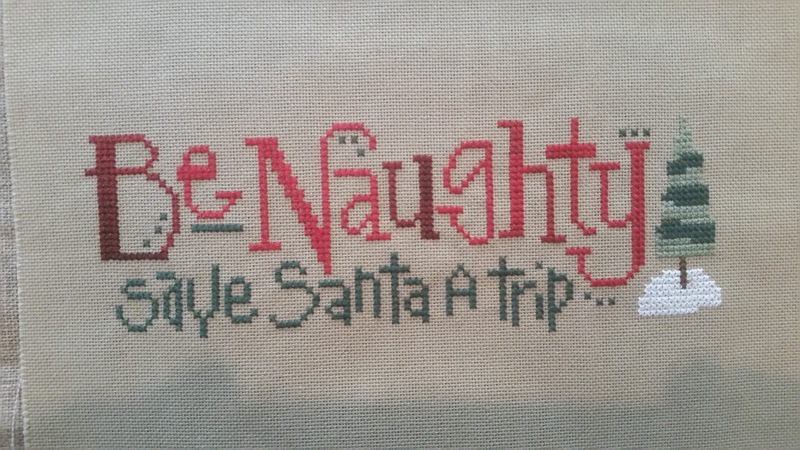 Much slower progress this week with finishing WIPs. I only completed the LK above (Love Crazy chart), which only needed a letter frogged out and the flower centers filled in. I am happy to move it out of my stitching basket. 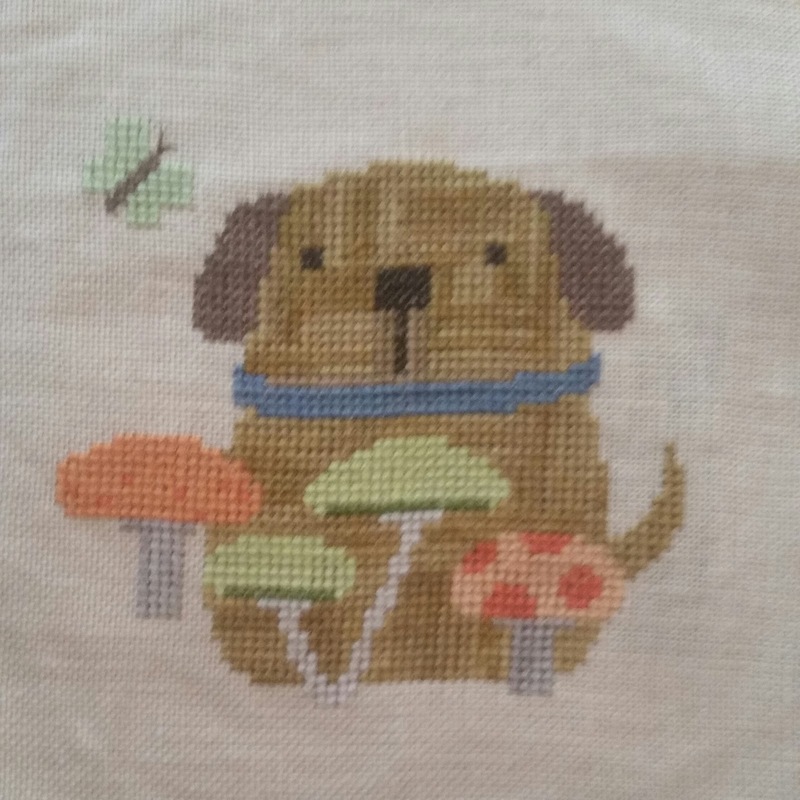 The linen is so dirty though, this one is an older WIP that sat untouched for many years because I ran out of a certain thread. While I store my WIPs each in their own bag this one is a little dingy. I am hesitant to wash it though as it is all WDW over-dyed threads and I worry about how much they will bleed. So I am hemming and hawing now over what to do with it. Though finishing the LK puts me at 12 finishes so far, so I can't be too disappointed in my week. 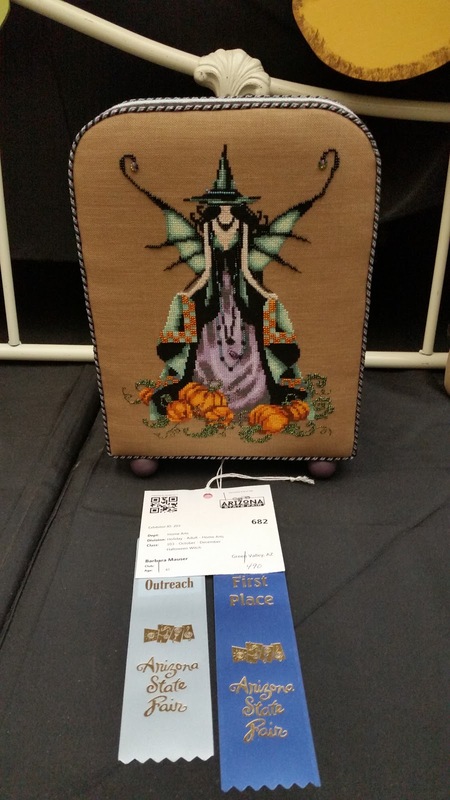 Only one more finish needed this year to reach my goal of clearing out 25% of my stitching baskets! 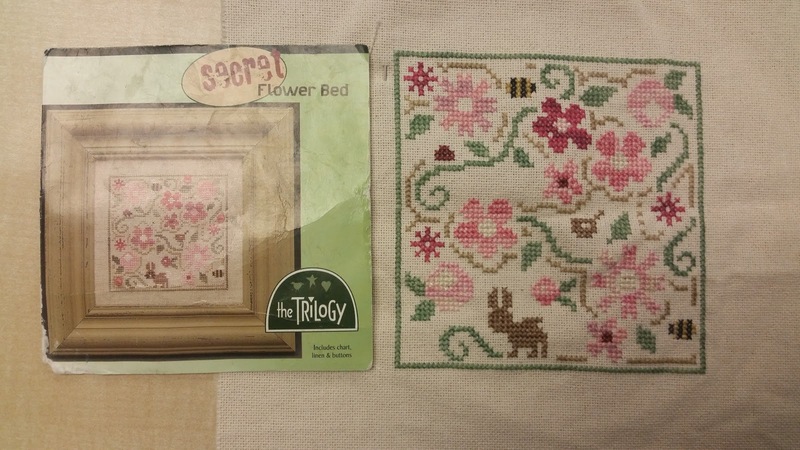 Above is "Flower Bed" by the Trilogy, which now has a tail-less bunny added, a beakless/feetless birdie, and two wingless bumblebees buzzing amongst the flowers. I have a good feeling this will be one of my finishes next week. And here is "Fresh as a Daisy" by Cricket Collection. 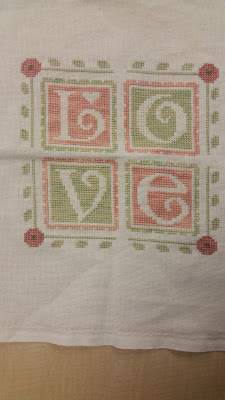 All I need to do is the centers of the violets, add my initial to the center, and stitch the vines between the daisies. Fingers crossed this will be my second finish next week. 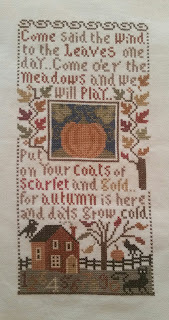 Funny that I am stitching so much Springtime in the middle of my favorite season Fall. Last but not least is my big project I am trying to get done. Another LK "Halloween Rules". 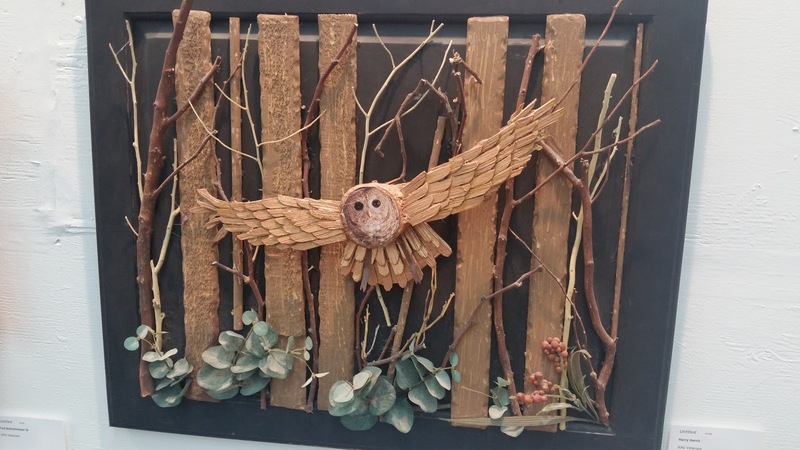 This project is at least 3 or four years old, and I love love love the design. 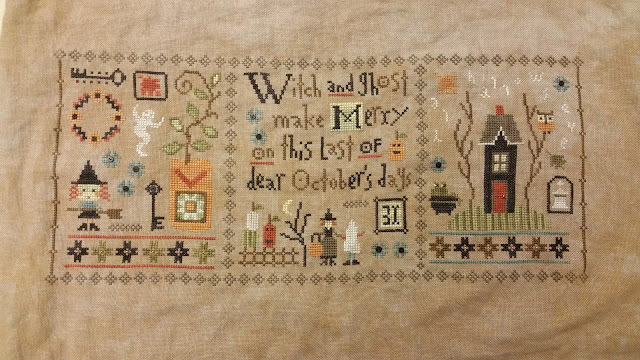 Lots of little fill in stitching left to do, but I am hoping this will be a Halloween finish. 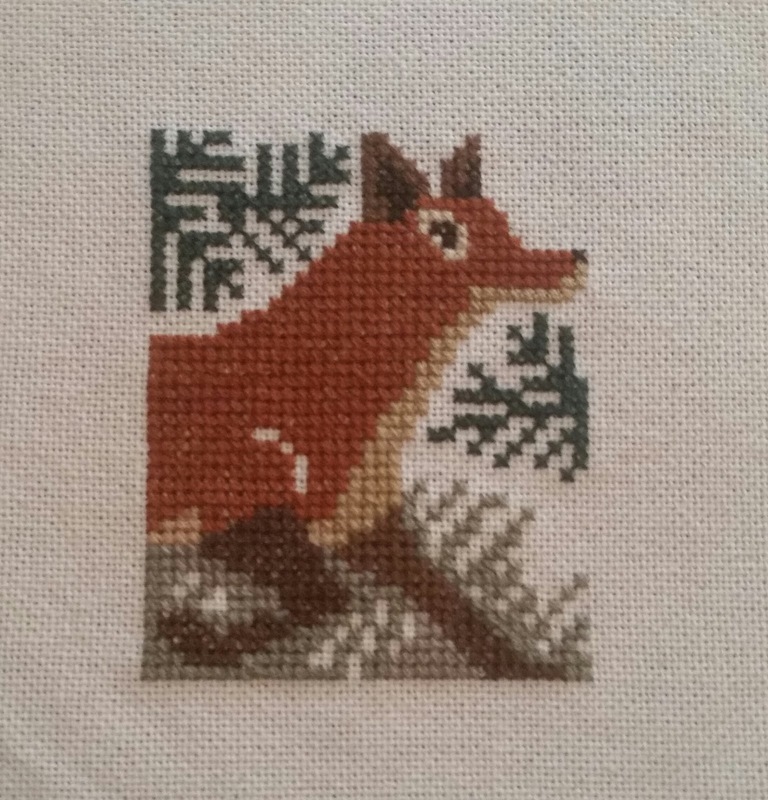 For non-stitching goals I have been doing good this week also. I ran a 10:45 minute mile tonight with my favorite border collie. My goal for the end of the year is a 10 minute mile. The weather here only gets nicer from here, but it does get dark out earlier each day, and it is harder for me to run in the mornings after work (still on night shift this year). Hope you week is going well and you are loving the fall weather as much as I am. It is so nice to be able to open our windows and let fresh air into the house after running the air conditioner for months on end. If it's getting colder where you are, stay cozy! That's how I feel this week! Like a cross stitching rock star all I need now are some leather pants! I buckled down and finished 11 projects last week! Or 20% of my WIP basket. My goal was to finish 25% of my stitching basket by the end of the year, which means only 3 more projects to get done and I will have met my goal. I'm not going to update my goal just yet, as a lot of the projects still in my basket are larger and will take me a little longer to finish. 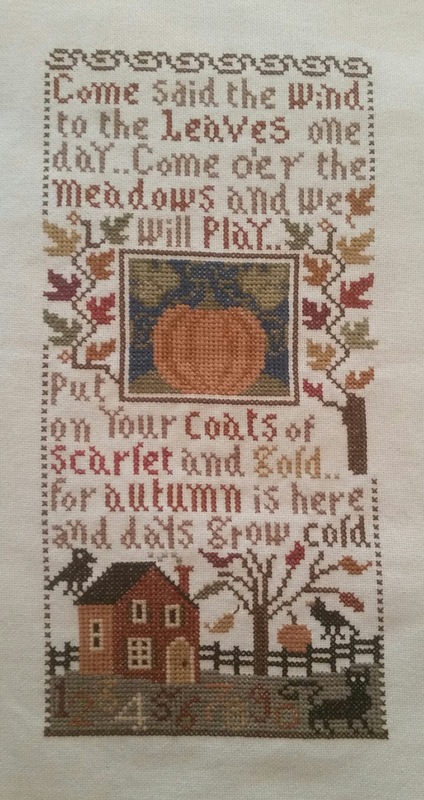 Above is Fall Fields by Prairie Schooler, all he needed were some branches and the grass finished but he had been in my stitching basket for 2 years now! Country Poppies by Cedar Hill. 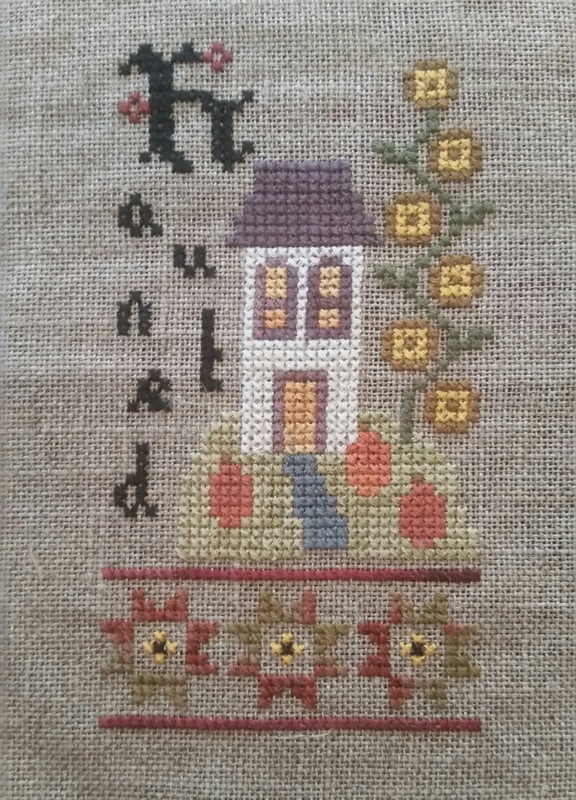 I had to finish a few letters and the flower stems. 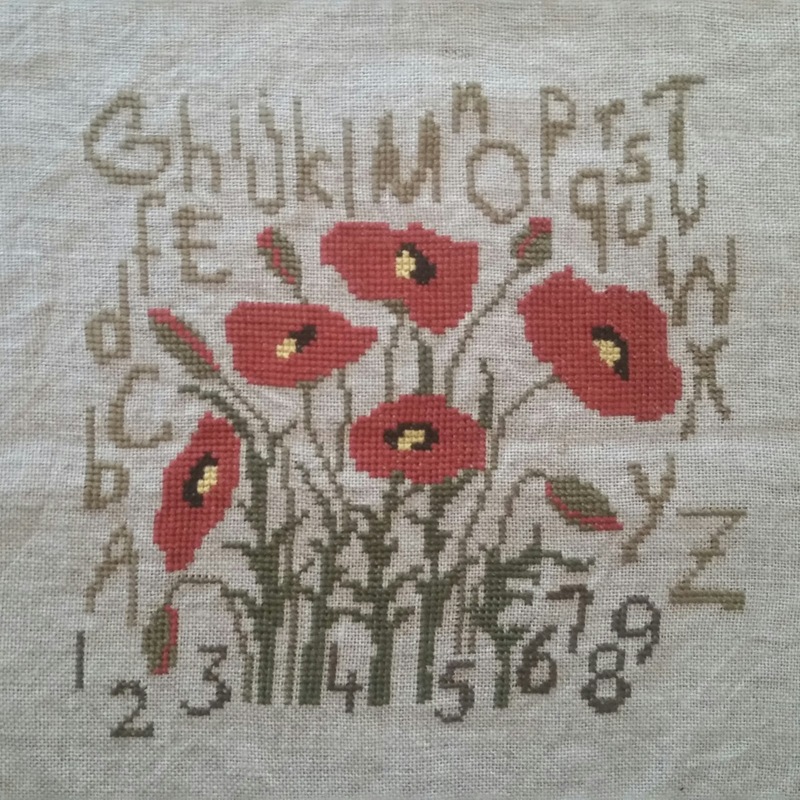 This one I purchased as a WIP off of ebay, such a pretty design I just had to finish it! 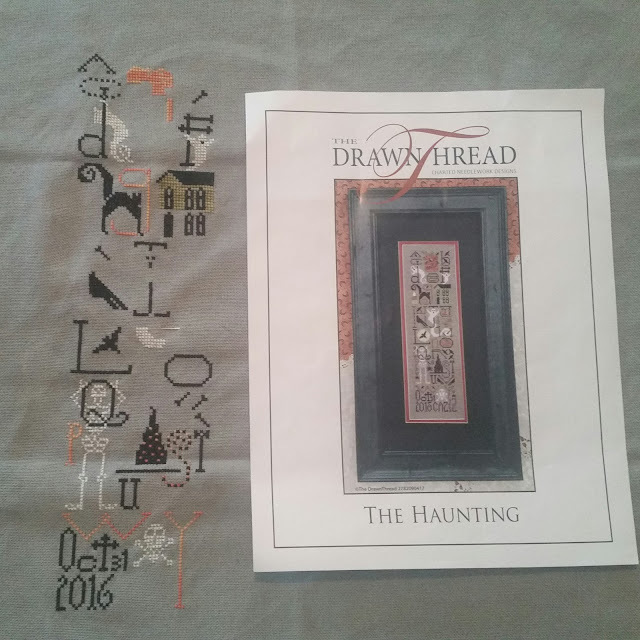 Haunted a Tingles chart by Lizzie Kate. I didn't fully finish this one, I left out the chimney and smoke on top of the house. Also I changed just about every color except black on the chart. 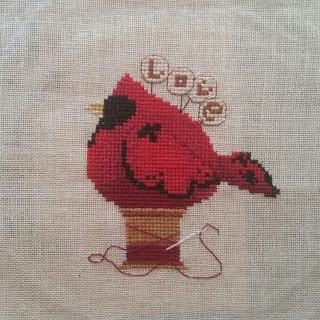 I LOVE stitching Lizzie Kate, but for some reason this one was more of a chore to finish. Another Tingles chart by Lizzie Kate, and this one I did love stitching. It took me 2 or 3 days to do all of the stitching, all I needed to do to finish it was attach the silly spider buttons, and you know how long it took me to do that? About 6 months cause I didn't want to dig out a beading needle! Cardinal Pincushion, by Just Another Button Co.
All I had left to finish this was two little stitches on his wing, and all of the back stitching. I left off all of the buttons, as I like him better plain. 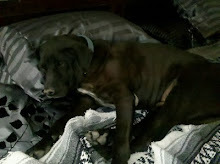 Little Brown Dog, by Bent Creek. 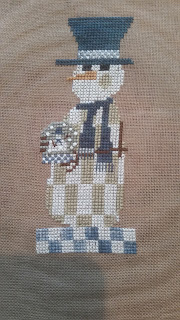 Not thrilled with the thread I used as it looks very stripey on his face. But this is a small project, and I am not going to lose sleep over it. 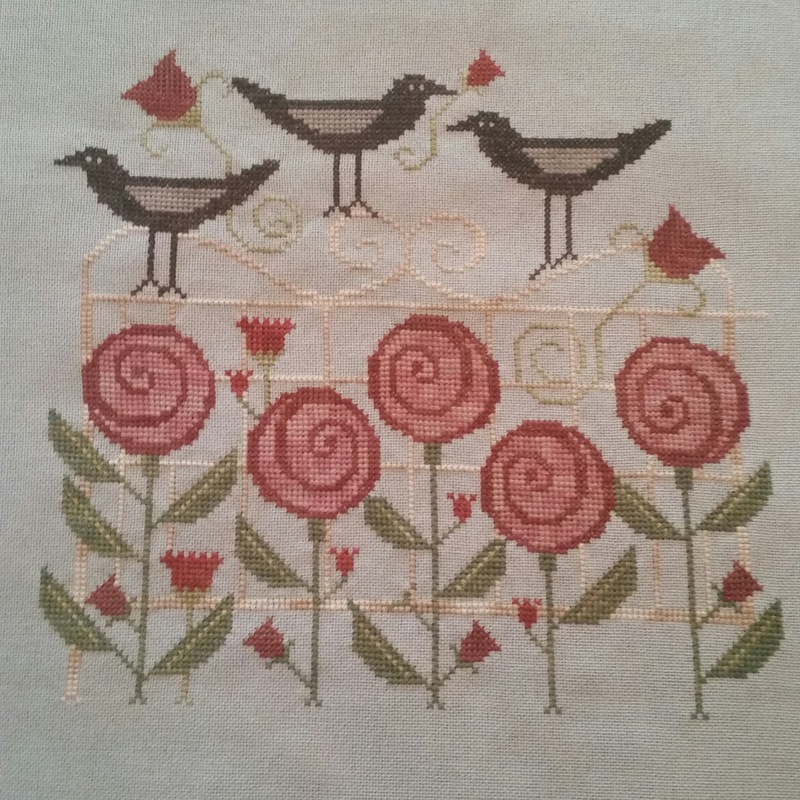 Blackbird Trellis by Plum Street Samplers. I loved the unique roses on this one, and am so glad I changed the thread the trellis was supposed to be stitched with. 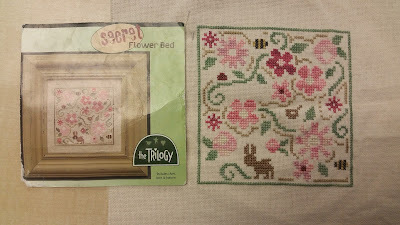 I used WDW Baby's Breath, and it turned out with some nice variegation on the trellis but still soft. Lizzie Kate Halloween Sampler. 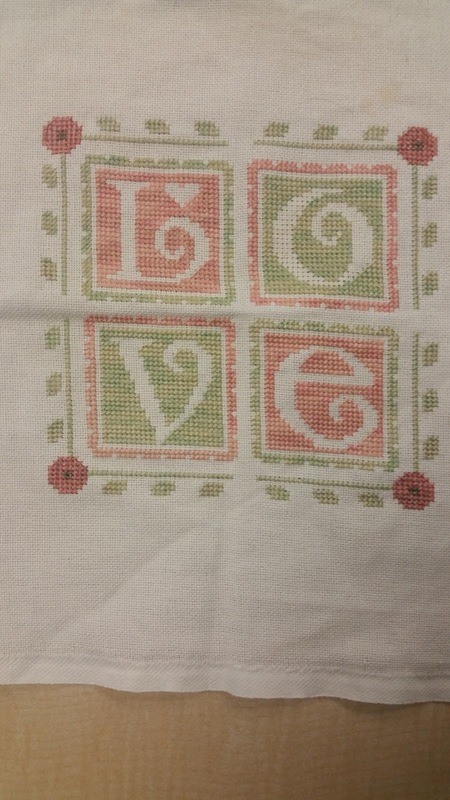 Another project I love, that has sat in my stitching basket for too long! All I needed to do was attach those beads and buttons, but I was too lazy to dig out my needles. I hand dyed this linen, and it turned out a very pretty grey-ish lavender. Snowman by The Trilogy. Love the checkerboard effect, and the the little snow-globe he is holding. Excited to have this one up on my tree this year. This one I didn't count in my original tally of all of my WIPS as it was already done, but I never posted it here, and it was a long timer in my stitching basket. Prairie Schooler "Autumn Leaves". I have the original chart for this, and have heard not good things about the reprints they are releasing. I always make a working copy of my charts, but still enjoy having the nicer original in my stash. Another Lizzie Kate small ornament, all I had left to do on this one was the tree to the left of the words. I left off the red buttons on the tree cause they seemed too big, I thought about doing french knots instead but kind of like my tree naked instead!